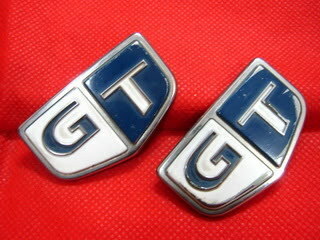 All Skylines have GT badges/emblems on their wings/fenders. As with everything Skyline they do follow a certain pattern up to a point and then go off at a tangent! Lets unravel so emblems and see where we end up. Starting with the 'original' C110, C210 GTR styles, these come in red or black and have the shape of GTR with what looks like a typically 70's font set (everything was cheesey in the 70's? I was). 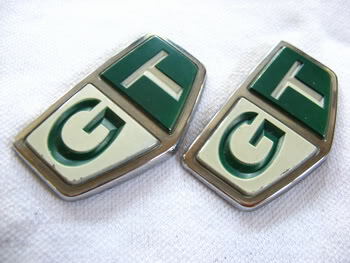 Next up are two examples of R33 GTR emblems, they are notable being a smaller size. The difference in colours signifies that blue is non turbo and red is turbo. 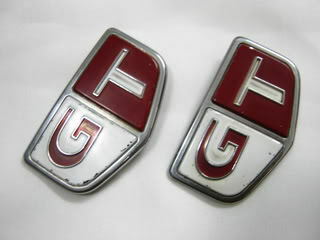 These badges come from a 370z, Infinity G37 which are USA branding. 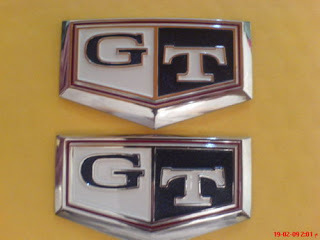 Next is a R34 GT Emblems, both in red and silver. Notice that the red is a lot paler than those shown above. Now we get interesting. Proper GT badges for proper Skylines. Well my Skyline at least! We have the red and white, which in the UK at least is pretty much the standard. 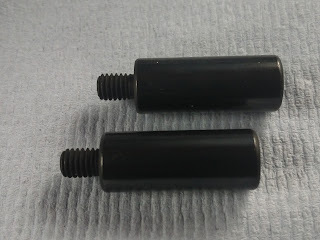 These do not wear well and getting good ones is difficult. Here we have the normally aspirated Blue and White badge. But the rule that blue means normally aspirated goes wrong with this emblem, again in blue and white but for a R34 GTR. Here's an odd one, genuine Nissan but in green and white. I'm assuming that this is made for non Japan markets, and is probably for a Silvia. Here's my badge, I actually brought this in Malaysia of all places. It is not (I believe) an official Nissan product and probably made as a JDM item. So basically they are all correct to some degree, although it is easy to get confused by the sheer array of badges available! Even asking the question on an owners forum will bring back many different answers (probably wrong) or no answer at all. So, lots of choices in emblems...never knew that! Then again, I am not an expert :0. Thanks for explaining what wings are, I found them on a pic in the blog:). 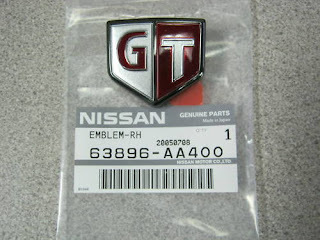 R33 badges were also available with gold in place of the chrome. 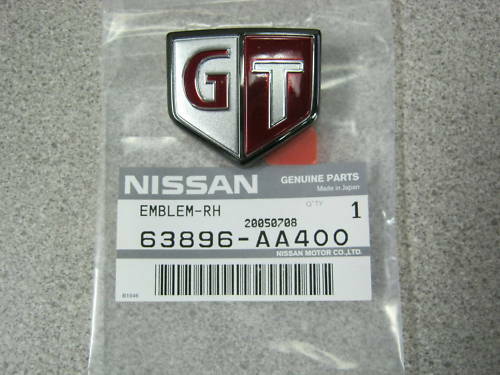 Actually the gold badges shown do appear in the catalogs for R32's. However I do not believe they were ever made for the 33. 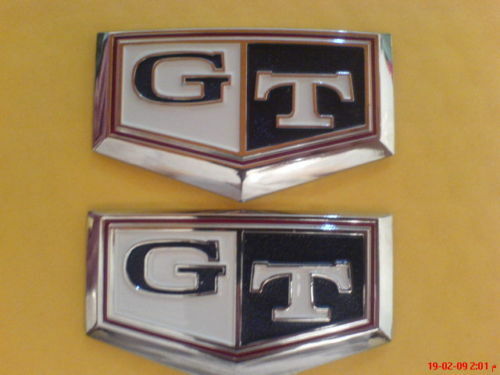 There are some GTR gold smaller emblems made in China and these may still be available via auction sites. 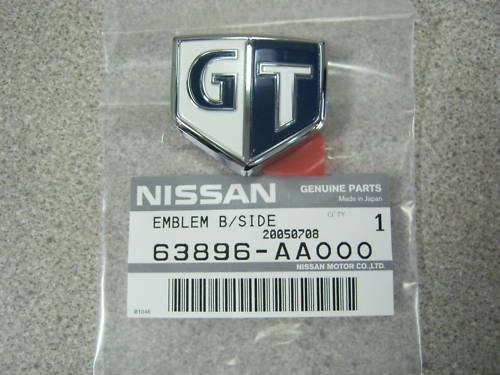 Friends in Japan said there are indeed gold badges for the GTR BNR32s before, but they're very, very rare.